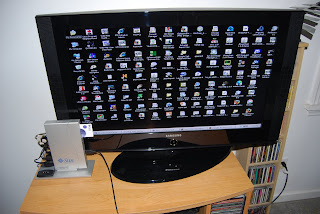 A few weeks ago I wrote about connecting my Sun Ray 2 wirelessly to my home network. I used a Linksys WAP54G which was really bulky and required a power brick. 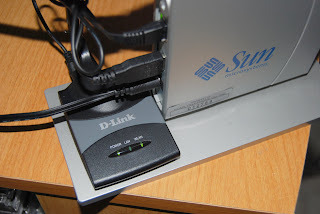 I ran across someone in the Sun Ray Users mailing list using a D-Link DWL-G730AP. So I ordered one. It is smaller than a pack of playing cards and is USB powered. This really makes for a much better solution. I was going to velcro it to the side of the Sun Ray but I thought better of it. There are some air vents that would have been blocked. The D-Link fits nicely under the Sun Ray power cord in the back.